Trump’s decision to quit Paris agreement : could it be good news ? Finally, he did it. Yesterday, in the rose garden of White house, President Trump announced that he will withdraw the United States from the Paris climate change agreement. 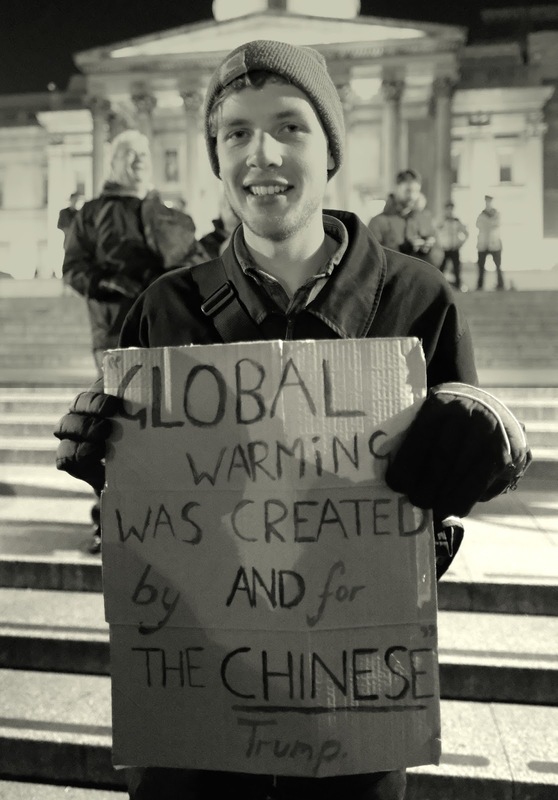 He repeated his usual arguments : human caused climate change is supposed to be a hoax invented by China to undercut US manufacturing - the plot theory is back. As Bush said before, Trump climate change claimed that US companies would suffer and be disadvantaged by efforts to reduce carbon emissions.« It is time to make America great again » he concluded. He won’t respect the US commitment that it would reduce its emissions by 2025 to about 27 percent below the level in 2005. In Europe and all over the planet, most of the leaders of government have denounced the decision of the world's second largest carbon emitter. Actually, it is not at all news. Trump's election was very bad news for climate change. Since the 100 days that he has been leading one of the greatest powers, Trump has taken down piece by piece every action that the former President Barack Obama did to tackle climate change in his country. He has picked to lead the Environmental Protection Agency (EPA) the climate change sceptic Scotte Pruitt. He's the one which launched multiple lawsuits against regulations put forward by the agency. Trump cut the EPA's budget by a third. And Scott Pruitt has begun to abolish the main measures in place to reduce greenhouse gas emissions. Trump has put down the clean power plan which aimed to cut CO2 emissions because he wanted to bring back coal mining jobs and reduce the cost of electricity. “For too long, over the last several years, we have accepted a narrative that if you’re pro-growth, pro-jobs, you’re anti-environment,” said Trump. He also called for drilling in the Arctic. He tried to resize national monuments in order to allow a better access for oil. These are only the main examples. Trump has in fact already quit the Paris agreement since he arrived at the White House. He has been accomplishing what he said, what he has been elected for and he has been following his “America First” agenda. It was a kind of global blindness not to have seen that and not to have denounced officially American policy towards carbon emissions. In a way the declaration of Trump is good news. It puts an end to a kind of worldwide hypocrisy pretending that the Paris agreement is on the way to addressing dangerous global warming. The atmosphere is non-political. What you have said is less important than what you have done. The announcement of Trump’s decision underlines the weakness of the Paris agreement, which is that it is not binding. There won't be any cost or any penalties for United States. The respect of the agreement was based on a name-and-shame system of global peer pressure. It was supposed that any country that does not respect the agreement would be seen as international laggards. Finally, it is a failure. But Trump could not let the United States so simply pull out of the agreement. He needs to wait three years or to also denounce the climate change convention which he doubtfully will do. Anyway, United States should wait until the end of Trump's mandate to implement policies to reduce CO2 emissions and reintegrate the international coalition of the countries that try to tackle climate change. But as the time goes on, it will be harder and harder to limit the rising global temperatures. The Paris agreement commitments were already too low to keep the temperature below 2°C. It could only limit it to 3,7°C. It was already necessary to review and reinforce the commitment of CO2 reduction within five years. The situation when Trump quits the White house will be worse than when he arrived with all the dramatic impacts. Will the announcement of Trump kill the agreement ? Certainly not. The leaders of Europe affirmed their strongest commitment. China, the largest emitter of CO2on the planet, will stay in the race of reducing their CO2 emissions. First of all because this reduction is linked with alleviating air pollution which is a major health issue for the country. Besides, it will give China more opportunity to develop and sell low carbon technologies. China, Europe and in a way also India have become world leaders of green and climate friendly development. And that's what Americans companies have understood. The switch away from fossil fuel will continue because that is where the market is going. Several business leaders have spoken out against the decision. Google, Facebook, Shell, Amazon, Tesla, Space X, even GM, Exxon mobil, Chevron, General Electric.. all the major global companies, including Intel, HP, Dell, have expressed support for the Paris agreement. "We believe that robust clean energy and climate policies can support American competitiveness, innovation, and job growth," tweeted Amazon. "In turning his back on the future, President Trump's abandonment of the Paris Climate Change Deal demonstrates once again that he is void of basic business acumen, foresight and initiative," said the former San Francisco Mayor Gavin Newsom. The risk that other countries adopt Trump's decision is finally low. The Paris agreement appears irreversible and the commitments still represent 72 % of the global emissions. But without America pressing for diligence and openness, efforts could be weaker for a part of the world, especially for the poor and developing countries. These countries expected the implementation of the pledge from rich countries of $100 billion in financial help to mitigate climate change and to adapt themselves to the impacts. Without Americans, the cash sources will be much less significant. Hopefully, the cost of clean energy, renewables and storage energy will reduce drastically. Solar power is becoming more and more competitive. Trump's decision won't change the mainstream but it could limit our capacity to reduce CO2 emissions early enough to prevent the catastrophic rising of the temperatures. It emphasizes that the Paris agreement is far from being sufficient. We need to do more and faster.